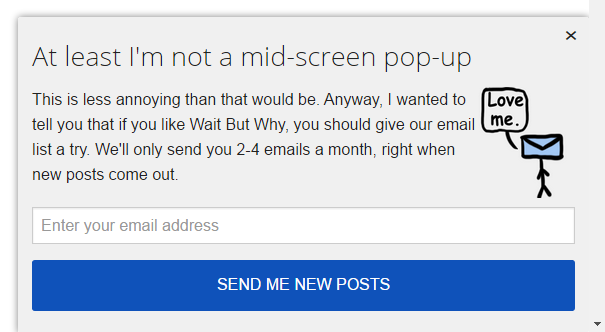 In the past year I’ve been noticing more and more condescending popups being used on websites. I think the pattern of an email popup halfway through an article is evil, regardless of how well they perform (loan sharks make good money, it doesn’t mean it’s a good thing). Somehow website owners have taken the annoying popup a step further and are now including condescending messages as part of their tone of voice. It could be argued that it’s done in humor, but having something take over my screen and get in the way of the article that I’m reading without me asking for it puts me in less of a humorous mood. I’ve complained about this before on twitter only for people to ask for examples…. which of course I can never then find… so here are a list of annoying condescending popups in my day to day surfing of the web. Not everyone is terrible on the internet. Here’s some (or at least one) example of how to do it properly. This popups up in the sidebar after reading half of the article. It doesn’t take over the screen and isn’t condescending. 0 Response to "Condescending Popups | Chumbart™"